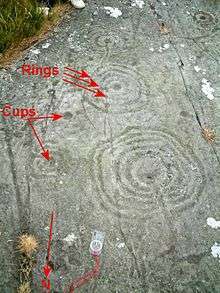 Cup and ring marks or cup marks are a form of prehistoric art found mainly in Atlantic Europe – Ireland (Complete), Wales, England (North), France (Brittany), Portugal, Finland, Scotland and Spain (Galicia) – and in Mediterranean Europe – Italy (North-West, Sardinia), Greece (Thessalia) as well as in Scandinavia (Denmark and Sweden) and Switzerland (Caschenna site - Graubunden). 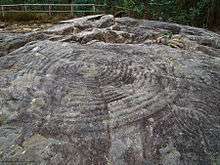 Similar forms are also found throughout the world including Australia, Gabon, Greece, Hawaii, India (Daraki-Chattan), Israel, Mexico and Mozambique. ↑ Francis Scott Elliot, George (1915). Prehistoric Man and his story. Seeley, Service. p. 398. ↑ Marchant, Jo (25 November 2009). "Deep Secrets: Atlit-Yam, Israel". New Scientist. Reed Business Information Ltd. (2736): 40, 41. ISSN 0262-4079. ↑ van den Brink, Edwin (2 Dec 2007). "Modi'in, Horbat Hadat and Be'erit (A)". Hadashot Arkheologiyot. 119. ↑ Mitchell, Eric; Jason M. Zan; Cameron S. Coyle; Adam R. Dodd (31 Dec 2012). "Tel Gezer, Regional Survey". Hadashot Arkheologiyot. 124. ↑ website of Tel Gezer's current (as of 2014) archaeological project; please update needs update] as the culture who built Tel Gezer's megaliths may be related to/descendants of the same culture(s) up to and including Atlit Yam's. ↑ The Spectator, p. 608. 1970. Retrieved 28 April 2011. 1 2 Alan Davis in Clive Ruggles (13 February 2003). 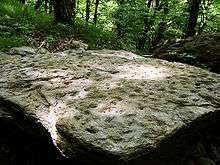 Records in Stone: Papers in Memory of Alexander Thom. Cambridge University Press. pp. 392–422. ISBN 978-0-521-53130-6. Retrieved 30 April 2011. ↑ MacKie, E. W.; Davis, A. (1989). 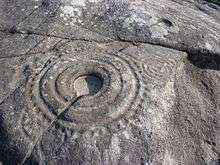 "New light on neolithic rock carvings: the petroglyphs at Greenland (Auchentorlie), Dunbartonshire". Glasgow Archaeological Journal. 15: 125–155.